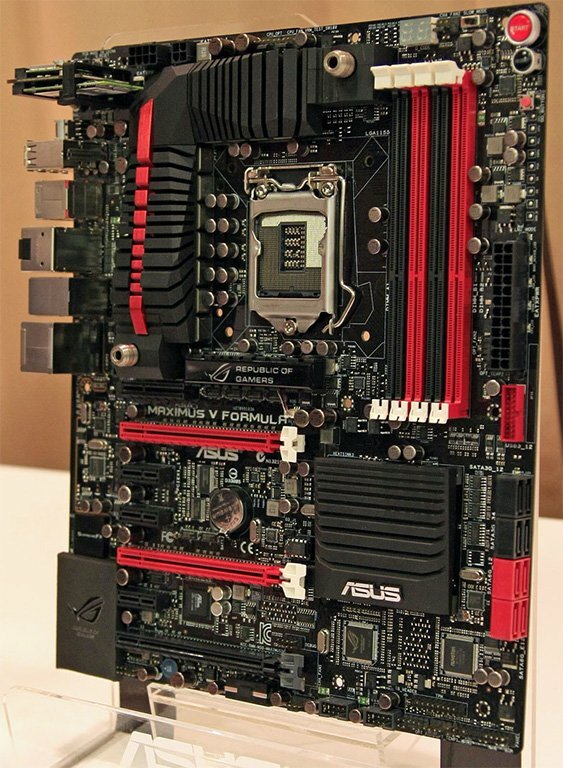 ASUS shows off the ROG Maximus V Formula at CeBIT, a new Intel Z77 based motherboard with 12-phase Digi+ VRM. The VRM area of the Maximus V Formula featured a heatsink with an embedded liquid-cooling channel that can be plugged into your water-cooling loop. The CPU is wired to four DDR3-DIMM slots, supporting up to 32 GB of dual-channel DDR3-2600+ (by OC). Expansion slots include two PCI-Express 3.0 x16 (x8/x8 when both are populated), one open-ended PCI-Express 2.0 x4 (wired to the PCH), one PCI-Express 2.0 x16 (electrical x4, also wired to the PCH), and three PCI-Express 2.0 x1. ASUS deployed a PLX PCIe 2.0 bridge chip to create more PCIe lanes for onboard devices. The board features ThunderFX audio, which consists of high-grade DAC and AMP circuitry that's ground-isolated from the rest of the motherboard. On the connectivity side, there's gigabit Ethernet and a dual-band WiFi module. Several ROG-exclusive features can also be found.